These tiny houses are cheaper to rent-to-buy than renting a room in Auckland. 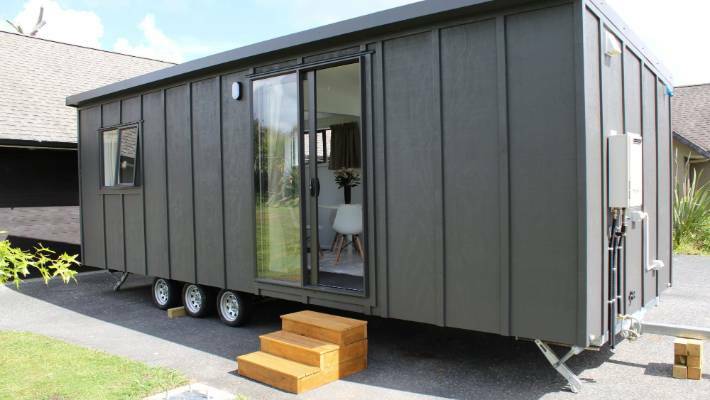 An Auckland company is selling tiny houses for weekly payments of $180 – cheaper than the average weekly cost of renting a room in Auckland. 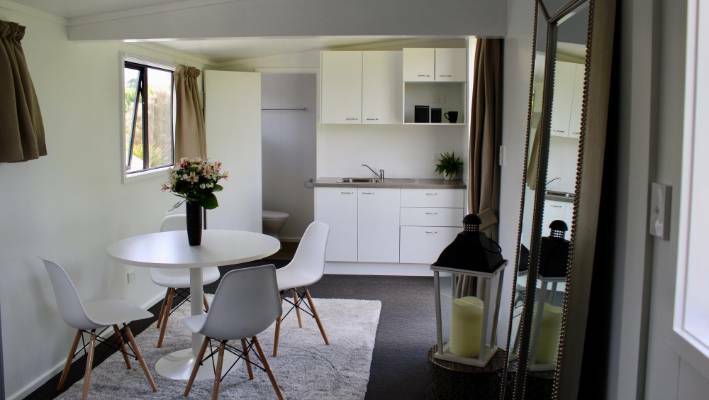 Would-be home owners locked out of the market due to high house prices can rent-to-buy a relocatable unit from Coastal Cabins, based in Dairy Flat, without having to fork out for a deposit. 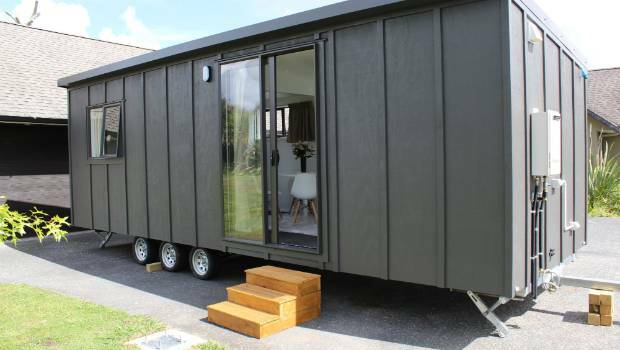 Coastal Cabins sales and social media manager Sharna Salthouse said she hoped the rent-to-buy scheme would allow people who couldn't afford to buy a tiny house outright to "make their way into the housing market in some way or another". "People are paying up to $600 rent, $700 rent these days and they don't get anything out of it. I think it's just a such important thing to give people [another] option." * Is tiny living really so terrific? The tiny homes - which varied in size from studios to two-bedroom dwellings - were priced between $33,900 and $54,950. Purchasers could pay them off over five years, at an interest rate of 9.95 per cent. Coastal Cabins is selling tiny houses like this one for weekly payments of between $180 and $290. ﻿For the smallest cabin, the weekly payments worked out at $180. The largest cost $290 to rent-to-buy. Salthouse said more than 100 people had enquired about the scheme during the past few months and she was expecting even more interest as rents continued to rise. The median weekly rent for a room in Auckland ranged from $175 to $342 in 2018 depending on the suburb, according to Tenancy Services. The latest QV figures showed the average house price in the super city was $1.05 million. Each of Coastal Cabins' tiny houses had a bathroom and a kitchenette, but did not come with land. Salthouse said most people who bought the tiny houses set them up on family members' or friends' properties but Coastal Cabins could sometimes help buyers find land to rent if they didn't have anywhere to put it. The living area inside the Coastal Cabins "Matai" model of tiny house. Chris Glaudel, acting chief executive of Community Housing Aotearoa, said although Coastal Cabins' rent-to-buy scheme could "certainly" help people into housing, it wouldn't give them the financial security that came with land ownership. "For households who have land that they can place a unit on, it is a potential resource for them. But if you look at somebody who is a beneficiary, what's the likelihood they're going to own [land] yet still be a beneficiary and have that type of need for this product?" Glaudel said it was good there were new options for people who wanted "something different from the traditional stand-alone three or four-bedroom house on a large section". "Providing these different alternatives are helping to better utilise land resources and give people more choices. And at the end of the day we need to provide more options than are currently being provided." Community Housing Aotearoa would not recommend any rent-to-buy schemes to clients until it had reviewed the finer details of the contract to ensure there were adequate protections in place for the household. University of Otago associate professor of economics Nathan Berg said investing in tiny houses could be risky because they were a new market. Whether tiny houses would increase in value or depreciate depended on whether regulations governing land use and building materials changed, he said. "There will be some renters who build equity in a cabin, find reasonably priced land, and do indeed solve their own housing affordability challenge. How many people can do that remains to be seen." Berg said it was possible that in the future, a stronger market for tiny houses could emerge, improving housing affordability, but only if land-use rules changed.